We’ve done live physical workshops where people would show up from all over the country (which was pricey for everyone due to all those travel expenses). During that time we absolutely didn’t record them. The reason? It actually never even occurred to us that people would want to re-watch them. Fast forward to October of 2016 when we started with the active virtual workshops. 2) Show them how a active virtual workshop actually worked. Since people have been teaching LIVE workshops for decades now, the concept of doing a workshop from your own home with simple technology was a little tough to grasp at first, but people have figured it out. Those were the 2 big reasons we why we recorded snippets of the workshop. 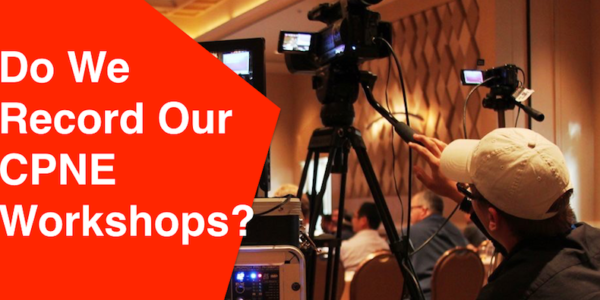 These days we still do record some of each workshop but NOT all 16 hours of it – and the reason for not recording all those hours and hours of content? Do we think you’ll NEVER take action? Do we think that sometimes TOO MUCH information is just as bad as TOO LITTLE? After talking to numerous tribe members that recently signed up, here is what we found out – A LOT of members have gone through MULTIPLE workshops and trainings and are no where NEAR READY TO TAKE THE CPNE TEST! You MUST take action that is physical action (like practicing on your dummy and breaking out those Lab Sim Station supplies every day). Too many people get stuck in this “Education Mode”, and don’t take action by performing the steps we lay out in the members area. This is why we WILL NOT RECORD EVERY MINUTE OF THE ACTIVE or PASSIVE WORKSHOP’s! You have enough to learn in the basic and advanced sections to then go over 16 hours of additional workshop footage (and get stuck in “Education Mode”!). After you go through the workshop, you’ll have all the knowledge you need to pass this CPNE exam so don’t worry. However, if you want to record certain sections of the workshop that YOU feel need to be recorded (like when you’re doing a lab sim station or PCS on your dummy) then we suggest reading this article on how you can record ANYTHING on a PC, MAC, Android/iPhone smartphone by CLICKING HERE. However, for the VAST MAJORITY of people, recording yourself will NOT be necessary as the instructors (myself or Scott) make the CPNE process simplified and we answer all your questions during the process. If you want to learn about the PASSIVE Virtual Workshop that we do in conjunction with the ACTIVE Virtual Workshop (started July 2017) then watch the explainer video HERE.